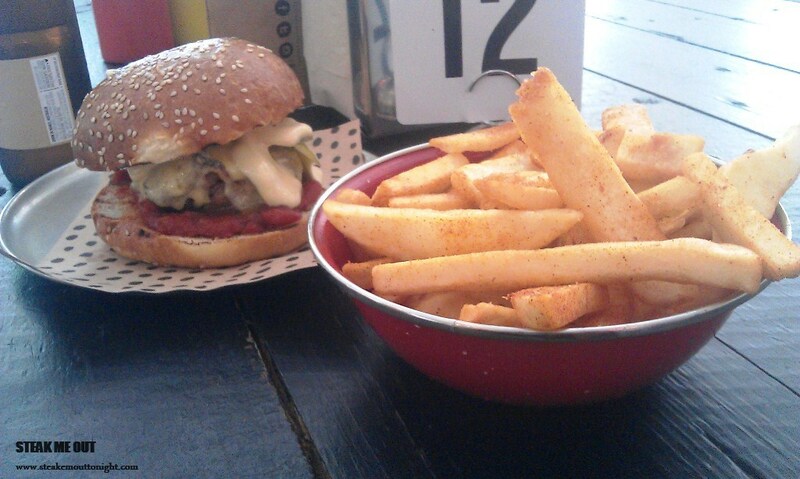 The first eatery on my Non-work related adventure of Sydney was Chur Burger. I’d seen pictures and read about it in The Age and all over the internet and needed to try it. It was a short stroll from central station; I entered bags in hand (it was the first stop after I got off the plane) and went to order a much needed beer and my food. 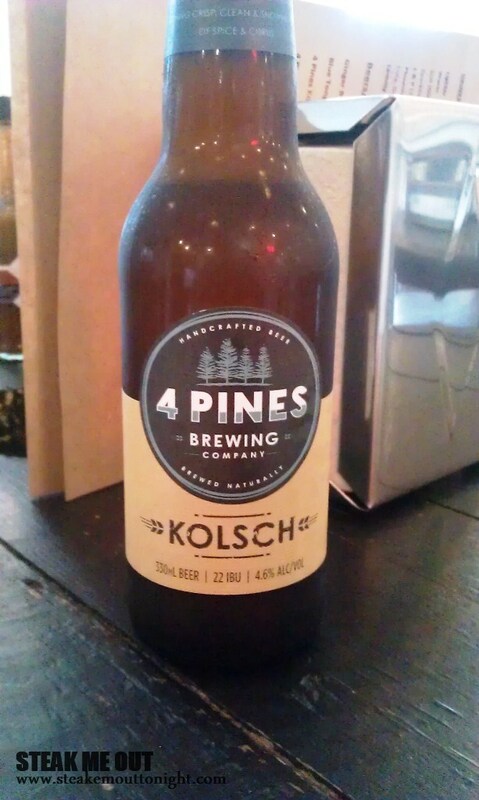 I ordered a 4 Pines Kolsch – a fairly easy choice compared to how long I deliberated over the food: cheeseburger, pulled pork or the pork belly special? I was torn. Half the photos show the pulled pork, but the cheeseburger was beef and the pork belly just sounded so delicious. After 5 minutes of intense soul searching I opted for the cheeseburger, to which I decided to add bacon ($11.5) because in the words of the Manager and Part Owner, Grant, “everything tastes better with bacon right” and a bowl of chilli salt chips($5). Once id paid I took a seat and struck up a conversation with Grant. Safe to say, I’m glad a man like him runs the joint. I mentioned my quest for steak around Sydney and he immediately phoned his butcher to see what he’d recommend but unfortunately he wasn’t available. About 15 minutes past from the time I ordered to when I received my food. Between having just gotten off a plane and the numerous take away orders (yes, they do take away) going out I felt like it was torture! The place was open – no walls even around the kitchen so you could watch as the chefs worked their magic – bright colours, spray paint and wood grained tables, with a real Latin vibe. It was nonchalant and trendy. 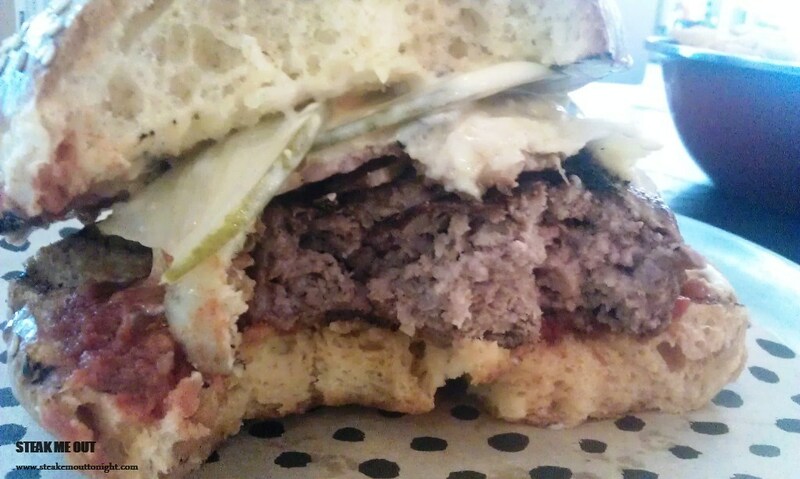 The burger looked and smelled good, it was clearly a handmade patty; with the exception of the pickle; all the layers were visible, bacon, cheese, tomato jam and mayo mustard. The brioche was good, toasted well and balanced, the tomato jam was so much better than sauce; it added depth and more flavour. The cheese and bacon were there, but not overpowering which was good. The beef was good, seasoned well, with the patty being thick and very meaty. The chips were chips, Grant mentioned the chilli salt was made in-house .That being said, it was astounding how similar it tasted to peri-peri salt. 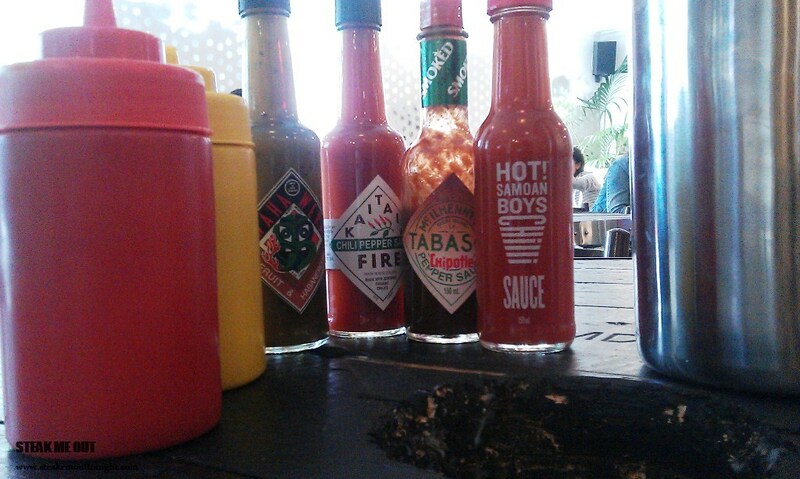 The variety of sauces (4/5 from NZ) available on the table were great, my favourite being the Kiwi and Habanero one, it was fantastic. I have but two complaints for this burger, one being too much mayo mustard (it was literally dripping with it), the other that the patty was cooked to well done; it lost a fair bit of juiciness and texture. Now, I like to give the benefit of the doubt, so I’m going to assume it was an off day and hopefully all the burgers aren’t as well done. 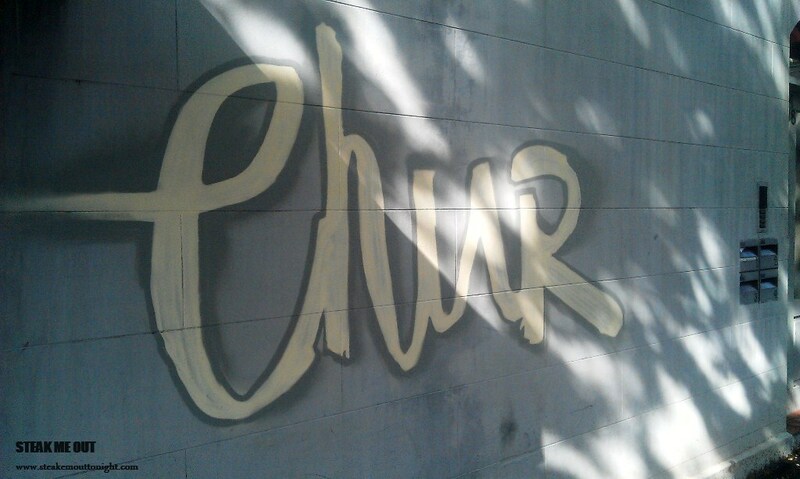 Chur burger is leading the charge in the wave of new hip and trendy eateries coming into Sydney. Their menu is simple but homely and enticing, and the atmosphere is fantastic. I could see myself becoming a regular there if I was a local. 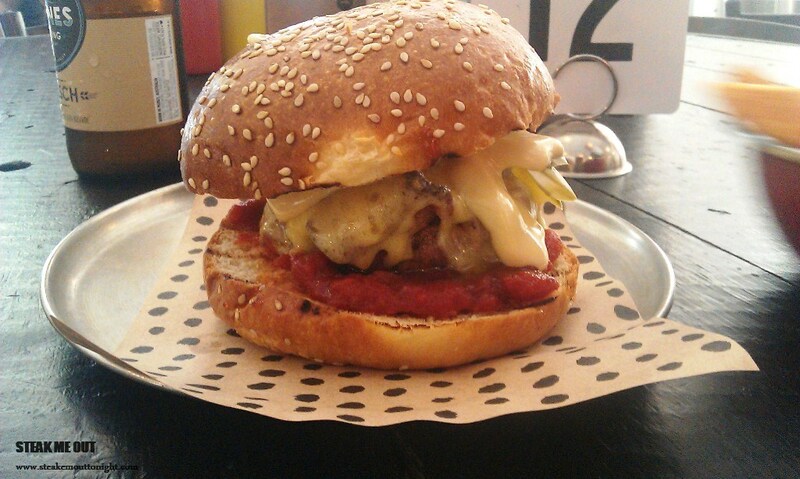 Posted on November 24, 2013 October 13, 2015 by AdrielPosted in Brunch n Lunch, SydneyTagged Burger, Great, Sydney.